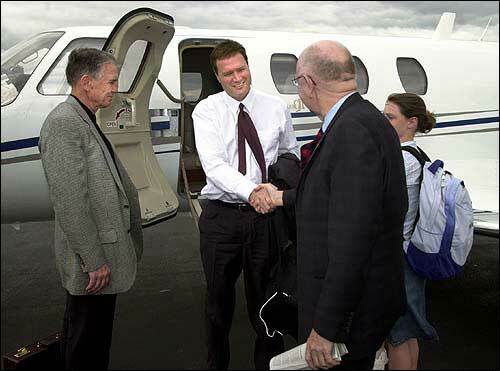 April 24, 2013 at 4:10 p.m.
Sunday was the 10-year anniversary of Kansas coach Bill Self's introductory press conference to become the men's basketball coach at Kansas University: April 21, 2003. Let's take a look back at the archives from that day. 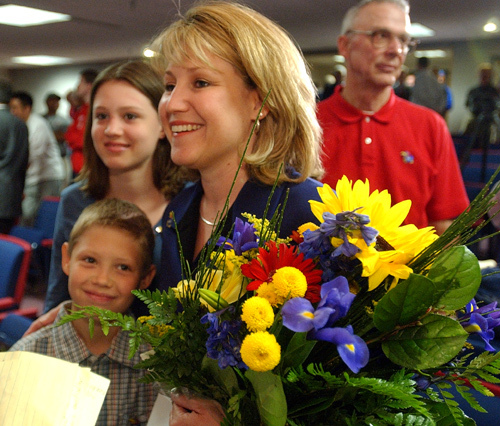 • Gary Bedore's main story from the press conference reads like you might expect ... with plenty of talk about how Self was committed to KU and believed it was a "career-ending job." "My future is not in Stillwater. It is in Lawrence. This is a once-in-a-lifetime opportunity. I think contractually there'll probably be a couple of things in there to make sure that couldn't happen. But I can tell you right now that (job talk) is over." Also interesting: Self's first contract was $1.1 million a year for five years, which is a far cry from the 10-year, $53-million extension he signed with KU last September (the $53 million figure is based on the assumption he fulfills the contract to the end). • Here's the transcript of Self's introductory press conference. "We'd be pretty glad if you'd just keep it for the next 25 years or so." Self is 40 percent of the way to that lofty goal. "It's like we fell out of a 10th-story window and we just landed in a vat of tapioca." • Then-Kansas State coach Jim Woolridge had some nice things to say about Self immediately after the hire. "People really take to him," Woolridge said. "He's an outstanding coach, an outstanding recruiter. People really will be pleased with Bill Self. He obviously will be different than coach Williams, but I know Bill's teams will play hard and be fundamentally sound and play great defense. He didn't get where he is today because he's not a great coach." 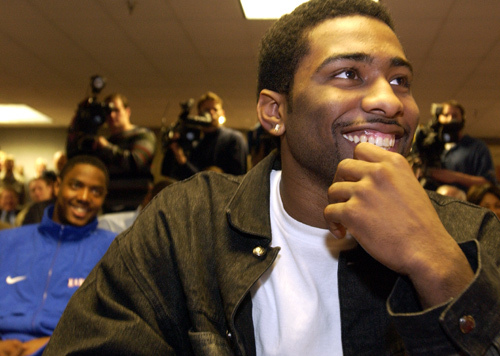 • The KU players at the time seemed happy with the selection of Self as the new head coach. "With Coach Williams, I thought I was in trouble every time I looked at him. Coach Self is a laid-back guy. I think we'll be a lot closer." At the time, David Padgett, Omar Wilkes, Jeremy Case and J.R. Giddens were the four KU signees. None of them ended up having an extended impact in KU's rotation. Padgett, Wilkes and Giddens all transferred, while Case averaged just 4.9 minutes and 1.8 points per game over his five-year KU career. At the time, KU also was in on unsigned recruit Charlie Villanueva, who later committed to UConn. • And finally, it appears young Tyler already was photogenic from looking at these pictures (the second one almost could be considered a photobomb). Awesome! Get the man a diamond ring for 10 great years. 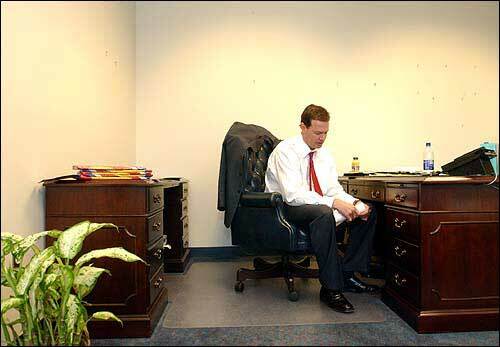 I can clearly remember assuring all of you that KU had hit a homerun when we hired Bill. Being in St.Louis, we got to see him up close and personal during his time in Illinois. I haven't got a lot right in my life but this one was a no brainer. By the way, thanks Misery for hiring "Hair Boy" and telling Bill to take a hike!! I guess a part of me will always worry, especially with the spurs job Glad he has been here ten years (wow that long already) and appreciate the hard work everyone puts into the finished product. This is the one thing about college athletics that drives me nuts. Bill Self is an amazing coach, but he's still just a human being. There is a habit amongst college fan bases to elevate the programs coach to god-like status. Like it or not people, there are dozens of other coaches in the world that could have had just as successful careers at KU the past decade. I really wish the fan base could take a step back and realize that at great as Self has performed, hes not bigger than the program itself. Self needs KU more than KU needs Self. Yeah, but has any previous coach at KU won 9 consecutive conference titles? Really? He is no god, but your comment about dozens being able to accomplish the same is ludicrous. Ralster, My comment on "dozens" stretches beyond the college ranks. I fully believe guys like Phil Jackson, George Karl, and Doc Rivers could run elite level college programs if they wanted to put up with the grind of recruiting. Its an unsupportable claim, i know, because ranking coaches is so subjective. Oh, I'd say it has worked out extremely well for both parties, so not sure your last sentence was really necessary or accurate. There was so much fear at the time Roy left that the "glory days" wouldn't quite be the same without him. Seems rather obvious to me to the glory days have been enhanced and that is a tribute to Coach Self. We needed someone that could maintain the excellence of KU basketball. We got someone that elevated it. What KU basketball does for the university really can't be underestimated, in dollars or in national perception. I think I know what you're getting at with your post, and I don't necessarily disagree with the overall premise, but Bill Self has been vital to the university. We are far better off with Coach Self. As a university and obviously as a basketball program. Congrats Coach Self on your 10 year anniversary and thank you for all you've done. Here's to another 10 years, and more! I bet there were at least a couple of posters here who criticized the hire. Congrats Coach Self and here's to 10 more years. I've been somewhat critical of Self the last couple of years for misses on the recruiting trail (DeAndre Daniels, Kaleb Tarzewski, Julius Randle, Anthony "Cat" Barber, etc. ), being too faithful and dependent on upperclassmen (examples: playing Elijah Johnson and Kevin Young instead of Tharpe and Ellis down the stretch of the Michigan game, not getting Andrew White in the rotation this last season), and running way too much isolation offense instead of his tough to defend high-low action with lots of side-to-side ball movement, but I'll never take the kind of success we've had the past 7 seasons for granted. It's very tough for me to imagine us being this consistently good after Self retires. I don't know if I'd say that DeAndre Daniels "disappeared".....if anything he seems to be "coming on". I'd look out for him next season in fact! At the time I thought we'd continue to win but Self would constantly be on the hot seat because 'Ol Roy had set a standard that couldn't be duplicated. I'd compare it to the Frank Solic hire at Nebraska. He won but not like Osborn. Who could ever imagine Self would be BETTER than Williams? I'd list the accomplishments but we all know them. 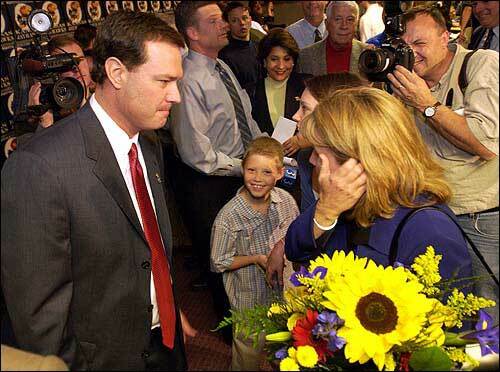 When they announced that Bill Self was the new coach of KU, I distinctly remember thinking " Really? This is the best that The University of Kansas can do? This guy should be coaching at Northwestern or Marquette or somewhere (no offense to those teams but..............)"
I was really ticked off, thinking that they had hired the first guy who raised his hand and said " yeah, I'll take that job." Good dang thing I wasn't in charge of hiring back then. I don't think that there's ever been a more obvious shift in a program upon a new coach getting his own recruits to run his own system. No offense to the holdovers from Roy's time to the Self era, but once Bill Self got two or three recruiting classes on campus his program really launched. I'm very grateful to guys like Langford, Miles, Simien, Graves, Lee, etc for sticking it out during the transition, but once they handed the reigns over to Robinson, Kaun, Jackson, Chalmers, Rush, Wright, etc. Then Bill Self looked like a master potter with fresh clay. I was IN LOVE with the move - in fact, he was MY first choice too. 4) someone who wasn't seeing us as a "Stepping Stone" to a Duke, UK, UCLA, Indiana or UNC....maybe someone who was either from the Midwest or preferred a Midwestern "way of life".....would automatically exclude someone like a Steve Lavin or an Eastern-preferred coach type. At the time Self seemed like the HR obvious choice. I honestly didn't even know who else was in the running back then. There was some thoughts on Calipari but EVEN THEN he was though to "be shady", etc. - - I think there were legitiamate worries that we'd have him and after just a few years he'd skip on to the NBA. FYI - Lon Kruger went from Florida to Illinois before heading to the Atlanta Hawks (then on to the New York Knicks as an assistant) - - Bill Self took his place in Champagne. I have to admit when the hire was announced I was concerned. I knew he could recruit players, but could he coach them? That was my thought process. That first year didn't help my thinking any, but the next year Isaw what he was trying to do and I was sold on it. He is an incredible recruiuter, even though he may miss a guy here or there, but one has to wonder what the other coach "did" to get him away from Bill and Kansas Basketball. He has surrounded himself with an amazing staff in the 10 years he's been here and that has helped in his coaching and in player development. Plus he went out and got Hudy! He's a great coach, to win 9 straight in any major conference puts you up there in greatness talk. He has a plan, a system and he works it. He makes changes in game and at half. I have never had any ill will towards Roy and I even got the chance to tell him that at the college world series while wearing my KU hat, he went home and can never fault a guy for going back home. Did KU hire the right guy? Yes they did. I know that now, it just took about 14 months to figure it out. I'm glad I was wrong at the begining. Bill did not actually go out and get Hudy. But he has to be mighty pleased that he bowed to the advice of his athletic director who was insistent that she was the right person for that job. Andrea has been an essential element to Bill's success. Just imagine the impact she has made on all these recent NBA lottery selections, esp. the physical development and healthy maintenance of our big men. Lew Perkins has absorbed a bundle of negative heat from the KU faithful. But he must be applauded enthusiastically for his recognition of the essence of Andrea Hudy who is a very rare jewel in the largesse of Jayhawk athletics. I watched Coach Self coach the pants off of Roy Williams in two NCAA games and wished before Roy ever left that Coach Self was our coach. He was destined for superstar-dom and it's so wonderful that he loves KU as much as he does. He could go anywhere he wants to. He's a future hall of famer, and every year he brings a level of excellence to our teams that is un-matched across the country. Nine consecutive conference titles says it all. Throw in 2008 and the way he runs the program with integrity, and he's been the best thing that could have happened for KU. I wouldn't trade him for anyone. I was there when Roy first walked out of that tunnel to a standing ovation, and I sure wish I'd been there when Self walked out. I just love this dude! I had the pleasure of being in a room with him when he talked to some alums and their kids, and he is the most engaging guy I think I've ever been around on that type of stage. He comes across as just so honest and humble, and he has every reason to be arrogant and conceited. What a great hire!!! Rock Chalk Jayhawk!!! Wow, love the video. That tells you a lot about the man right there. Williams was hard to follow who followed a guy who followed another guy, all of which where hard to follow. Agree with the conclusion. Hoosiers should have been Jayhawks. No matter how many championships Kentucky wins it will never be Kansas and nothing, nothing will ever satisfy that empty feeling inside a Kentucky fan that they will never be Kansas.